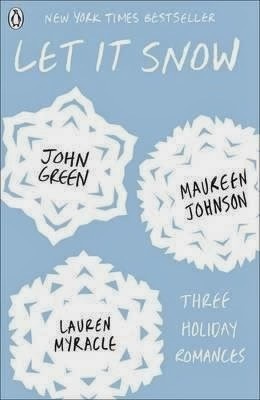 A trio of today's bestselling authors - John Green, Maureen Johnson, and Lauren Myracle - bring all the magic of the holidays to life in three hilarious and charming interconnected tales of love, romance, and kisses that will steal your breath away. This was another book that was recommended for me to read around Christmas. (I mean, it's pretty obvious really; with the snowflakes on the cover). I haven't read a book by Maureen Johnson or Lauren Myracle before, so I went into their stories blind of their writing. I've only read The Fault in Our Stars by John Green. I absolutely loved it, so I was excited. Although, I did hear his Christmas story was a let-down. The Jubilee Express by Maureen Johnson has short chapters. It's written from Jubilee's perspective. Jubilee is a great main character. Noah I absolutely hated. He didn't deserve Jubileee one bit. I had doubts about Stuart at first, but in the end he was a genuine person. The story was good, and it made me want to continue. Although, I did want to see more of Jeb as I liked his character. I absolutely LOVED Maureen Johnson's story. It was so PERFECT and FULL OF SWOON. Just what you want for the festive period. If I had to rate that on its own, I'd give it five out of five stars. Cheertastic Xmas Myracle by John Green was a bit of a disappointment. After reading Maureen's story...this was nothing compared to that. I just didn't connect with it. I did like the character Tobin and Duke though. They're both cool and are cute together. It honestly could've been better. The Patron Saint of Pigs by Lauren Myracle was a good story. I liked the character Addie. At first I hated her as she craves attention, but she ends up changing for the better. Jeb was in this story! I enjoyed that, haha. All the chapters end with cliffhangers. It was nice to read around Christmas. Overall I gave the book a four out of five stars.